Editor’s note: During each Chips Quinn orientation and multimedia training in Nashville, Tenn., scholars are required to complete a mobile media reporting module, which includes producing videos and reporting and writing stories. Stories by Natasha Dangond and Jenny Ung conclude the showcasing of work from 2017 CQS orientation. 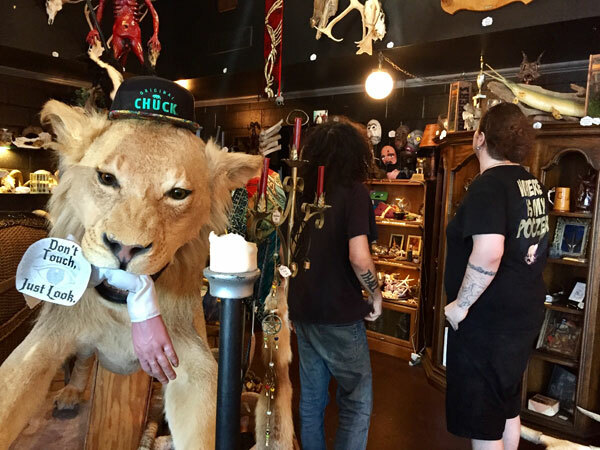 NASHVILLE, Tenn.—From the stuffed lion wearing a hat with the word “Chuck” on it to a human skeleton lying in a coffin to books on witchcraft and dark magic, Hail, Dark Aesthetics, has just about everything for adventurous shoppers. J.D. 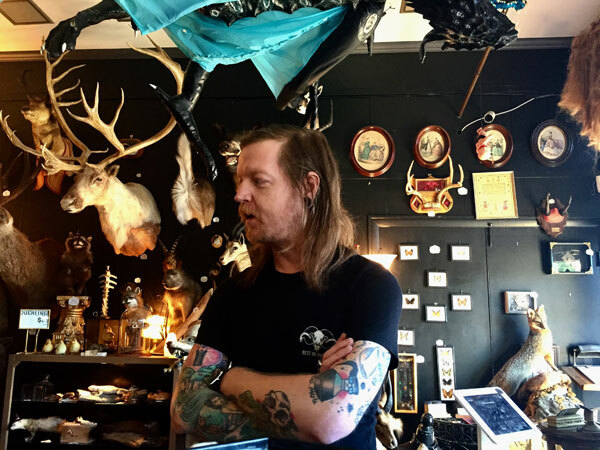 Tucker, 38, covered in tattoos and shiny skeleton rings, wearing a T-shirt reading “Rest in Pieces,” owns the 1,700-square-foot shop that opened on Halloween of 2013 in the city’s East Nashville neighborhood. Tucker began collecting taxidermy six years ago, when he found his first piece: a deer head inside a Habitat for Humanity’s resale store. He became obsessed with hunting for unique objects in flea markets, estate sales and antique shops, and opened the shop. The name “Hail” comes from a bone jewelry company he had at the time, selling out of a boutique in the Five Points neighborhood. The collecting of oddities “kind of got out of hand, and I kept finding stuff, so after a couple years it was either quit buying stuff or start selling stuff,” said Tucker. Tucker now receives most of the items found in the shop by word of mouth. “I built a reputation of being the guy that likes buying weird stuff, so now people bring things to me,” he said. Next to the counter where Tucker waits for customers is an array of animal heads poking out of the wall with beady eyes, hanging alongside colorful butterflies in glass frames and a group of stuffed ducklings perched on a shelf. Quentin Ridge, a customer from Murfreesboro, Tenn., was making his first visit to the store, after his friend gave him a bisected fetal pig for his birthday. “I love that kind of stuff, it’s really odd. Two-headed cows, skulls, and embalming tools…This is really awesome! ” Ridge said. The oddness of the objects is not the only strange part of the museum-like store, Tucker said. People from all walks of life come in and out of his story every day. After having a successful few years of business, Tucker opened another shop in Cincinnati in 2016, on Halloween. His goal is to make the market of taxidermy more affordable and accessible to customers. Most items in the store are priced under $1,000, depending on their condition. “I want hardworking Americans to have access to things, too, not just rich people,” Tucker said. Customers are not limited to human skulls and jarred specimens, though. At the back of the store, shoppers who aren’t intrigued by the rest of the merchandise will find a room filled with a selection of handpicked vintage clothing and $1 metal records. “There is something in here for everyone if you give it a shot,” Tucker said. his store, Tucker singled out his most prized possessions: the two-headed calf he received from a man in Kentucky and the large stuffed lion on display in the center of the store. Tucker took a road trip to New York with a friend, and traded Victorian spider monkeys and a seven-foot ostrich for the lion. 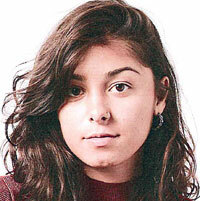 and told us to get going,” Tucker said. As for the future of Hail, Dark Aesthetics, Tucker hopes to open a third location, start a clothing line, and possibly even open a gothic-themed bar and restaurant. This entry was posted in Chips Quinn Scholars and tagged 2017 Summer by Colleen Fitzpatrick. Bookmark the permalink.